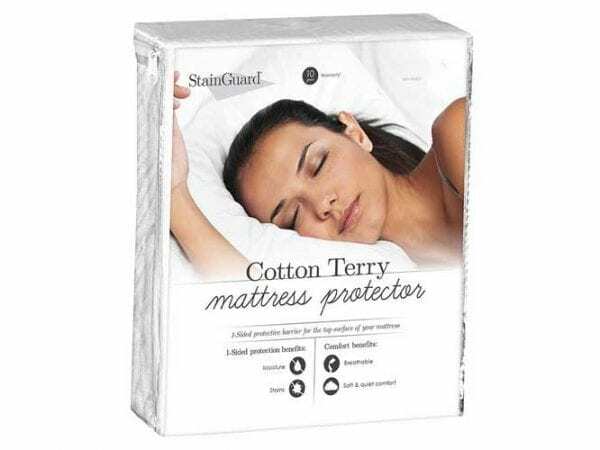 StainGuard® Cotton Terry Mattress Protectors provide a comfortable, low-cost solution to protecting the top of your mattress against stains. Made with plush cotton terry fabric, StainGuard® mattress covers provide excellent surface moisture and stain protection for the sleeper. 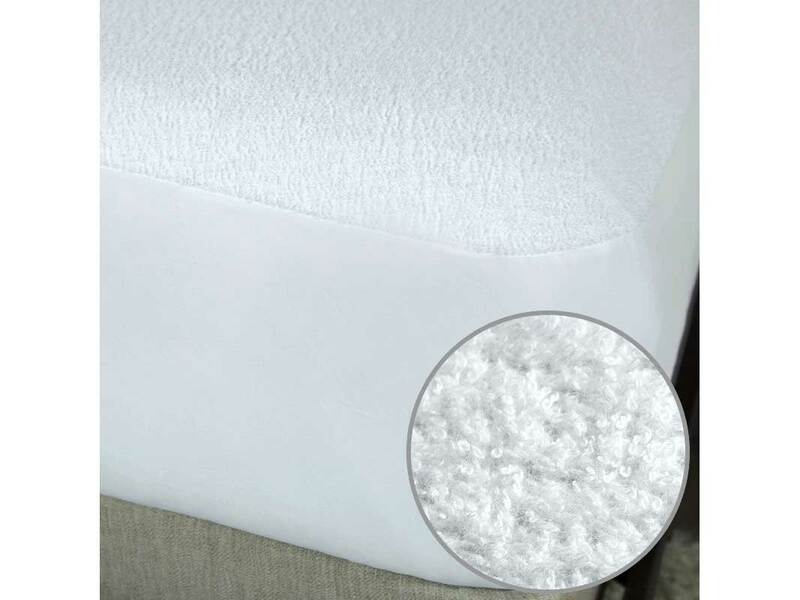 These mattress protectors offer 1-sided stain protection to ensure that the top of your mattress remains clean, and can provide some dust mite and allergen resistance. 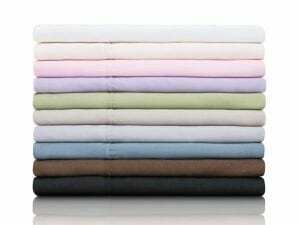 Cotton terry mattress covers are ideal for most beds but especially guest bedrooms and minimal use mattresses. Most people do not realize it, but a mattress protector is probably one of the most important accessories you can invest in for your mattress. Some of our most troubling moments as mattress owners come from unexpected spills and stains, microscopic allergens, and accidents we swore would never happen. There is a lot of confusion and misunderstandings as to what a mattress protector will actually do for your mattress. A common misconception is that mattress protectors are only needed on beds where “bed-wetting” might be an issue. This could not be further from the truth. If you can answer yes to any of these questions, read on to gain a better understanding of why you need a mattress protector. I have pets or kids. I spend a lot of time in bed. I sweat or drool while I sleep. I’m sensitive to dust mites and allergens. I’m concerned about getting bed bugs. I’m prone to accidents in bed. I eat and/or drink in bed regularly. I want to add a little softness to my bed. Spot cleaning is time-consuming and inconvenient. I just want to protect my investment and/or keep my warranty active. What do mattress protectors do? It keeps the mattress looking new and clean. Even with a shower right before bedtime, most people underestimate how many fluids the body produces overnight. For starters, we all perspire as we sleep, some more than others, but nobody is exempt from this. Our bodies naturally produce oils to keep our skin soft and healthy. Often, some people go to bed still wearing makeup. Our bodies are also constantly producing and shedding skin cells in astonishing quantities. And of course, there are other bedroom activities that can leave a “wet spot” on your bed and leave a stain on the mattress. All of these bodily processes make their way through your sheets and into your mattress, and once any of it gets into the fibers of your mattress, it is very difficult if not nearly impossible to remove from your mattress. The single most effective way to prevent most or all of that from entering your mattress is by using a mattress protector. Having a mattress that feels as supportive and fresh as the day we bought it is something we all want. Mattress protectors will keep your bed feeling new. Sweat or any other moisture, like spilling a drink, will wear down the foams and fibers within a mattress, significantly reducing the comfort life of that bed. A common comparison to this effect is how clothing breaks down over time due to the wash cycle. Given the amount of time we all spend in our beds, it only takes a small amount of moisture to each night to create a cumulative effect that will leave your mattress feeling worn and unsupportive. What this means for you, is that your nights are less restful and you will need to purchase a new mattress more frequently. Many of us suffer from minor allergic reactions caused by dust mites in our beds without even knowing the source. It can just be a feeling of general unwellness. Allergic reactions to dust mites are actually very common and can lead to discomforts such as sneezing, runny nose, wheezing, and shortness of breath. It is often mistaken for a common cold. Dust mites survive off of the dead skins cells all of our bodies shed. They produce waste products from the skin cells they eat that irritate the lining of the airways and lungs and particularly with children can bring on allergic reactions, asthma and can irritate skin conditions such as eczema. Without a mattress protector, your bed will have millions of dead skin cells in it, leaving you and your kids susceptible to dust mite infestations. When we talk about the longevity of our mattresses when considering a purchase, we look at the manufacturer’s warranty. What most people do not realize is that stains from normal use will often void that warranty leaving you with a worn out bed and no warranty. Moreover, yes, even if that stain has nothing to do with the reason you took it in in the first place, it will still void that warranty. It is a frustrating reality for many mattress owners but it is one issue that can be easily avoided by investing in a mattress cover. For all of those reasons and many more, nobody should ever sleep on a bed not protected by a mattress cover. Some people confuse a mattress protector with a plastic cover placed under the sheets or mattress pad. They are not the same thing. Many adults remember the uncomfortable crinkly plastic covers used when they were children. Mattress protection has come a long way since those days. Protectors are quite soft and have a comfortable and natural feel to them. 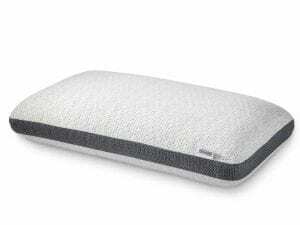 Pads often add a little height and padding to your bed as the name suggests. Protectors, however, do little to change the natural feel of your bed. If you start with the correct mattress, you should not need the extra padding on the mattress; the simple yet effective StainGuard® waterproof mattress protector should be all you need. Some of our customers also use a mattress topper which can be much thicker than the pad. In these cases, we recommend using the StainGuard® protector over the topper so that it protects both the topper and the mattress. 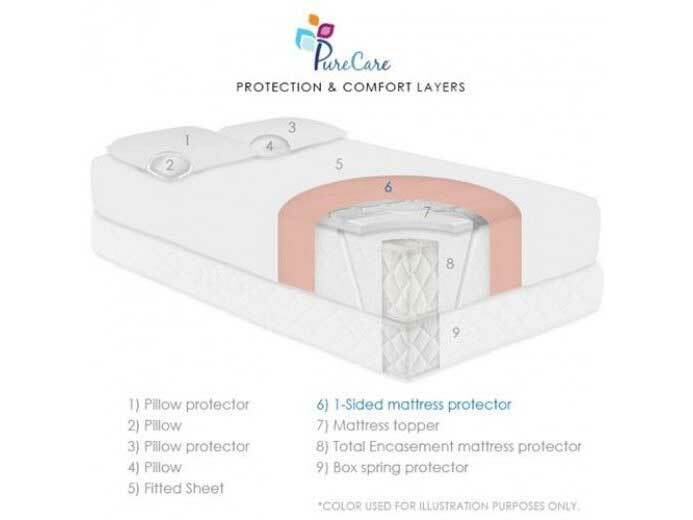 If you are interested in buying the PureCare StainGuard® Cotton Terry Mattress Protector, or pillow protectors, visit a Best Mattress today. We have 21 locations throughout Las Vegas, Mesquite, and St. George, so there is sure to be one near you. Our friendly sales associates can recommend PureCare products based on your preferences to help you find the perfect products for your home. 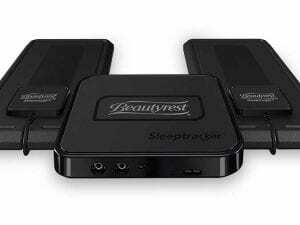 We cannot wait to help you get the best sleep of your life.